This is Greek cooking at it's best. Pastichio is a well known Greek recipe used much when entertaining large groups such as a baptism, holiday meal or dinner party. What makes this dish so perfect for a larger group is that it can be made ahead of time and kept warm. Or even made a day in advance and just reheated. It is so convenient when cooking several foods as your oven is free to prepare other dishes that must be cooked just before serving. Meat Sauce: Cook onion in a little water until water is absorbed. Add butter and saute onion and garlic, add meat and continue to saute breaking up meat as it browns. Drain out any excess fat, but leaving a little in the pan. Add remaining ingredients for the meat sauce. Simmer for 45 minutes. Set aside. Pasta: Cook pasta as recommended until al dente, drain in colander. Rinse the pot out with hot water. Using the same pot, melt the butter and return the pasta to the pan. Stir to coat past with butter, add egg whites and cheese and stir again until well mixed. Set aside. Custard Sauce: Melt butter, add flour to form a smooth paste. Heat milk to boiling point, along with salt, pepper and nutmeg. Add butter flour mixture slowly to milk, stirring constantly until milk thickens. Add beaten egg yolks to milk. This will immediately thicken more. Add cheese and continue mixing until blended. 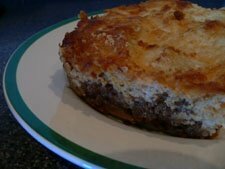 Tips: Wine used in this Greek Pastichio recipe is to be added immediately after the browning of the meat to simmer along with all the other ingredients for the entire cooking process. It is commonly thought by many that wine should be added at the end of the cooking, but Mom taught that when cooking Greek recipes to add wine right away. Always allow time to prepare Greek recipes. To me fast Greek food does not fit with traditional Greek recipes. The food I know takes time and loving care to prepare. If you take short cuts it will not turn out as well as you would be expecting. Then you have wasted time and money preparing a dish.